People often ask me how long it takes to weave a towel. 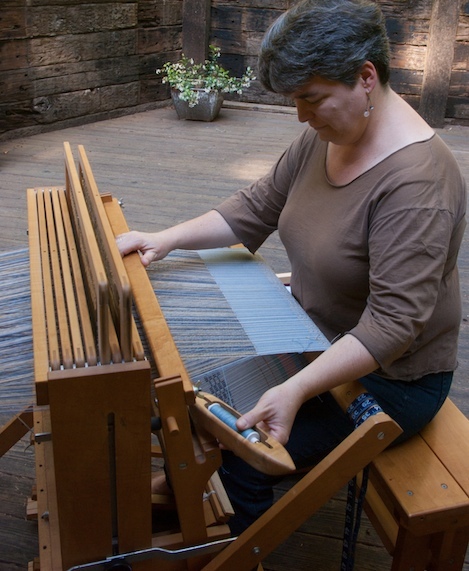 Actually weaving the towel – sitting at the loom and throwing the shuttle back and forth – is only one step in the process. 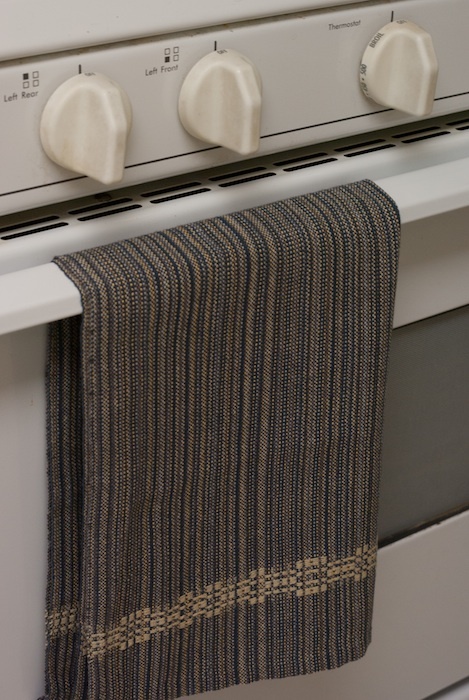 The whole process includes designing the towels, dressing the loom for 10 – 11 towels, weaving the towels and, finally, finishing them. I don’t know how many hours the entire process takes, but I used to start a new project on Monday and finish the group of towels by Friday evening, working 2 – 8+ hours a day. The amount of time varies depending on what else is going on in my day. Fridays I often work late finishing towels for a show or farmers’ market on Saturday. To learn more about the specific steps involved, keep reading! The basic steps are essentially the same for any weaving project, but let me illustrate the process with the Gulf Shores towels. I am always looking at color and color combinations. When I’m out walking my yellow labs, I notice the lichen on the redwood trees or the way the grasses have dried to beautiful browns and subtle golds. I pick up brochures at paint stores and look through books on interior design. I pay attention to people’s clothing. 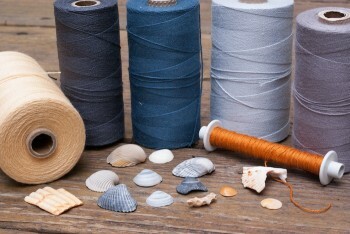 Sometimes bobbins of thread end up next to each other on my desk when I’m working on something else and spark an idea. The colors for this group of towels come from shells that I picked up on long walks on the beach in Gulf Shores, AL. 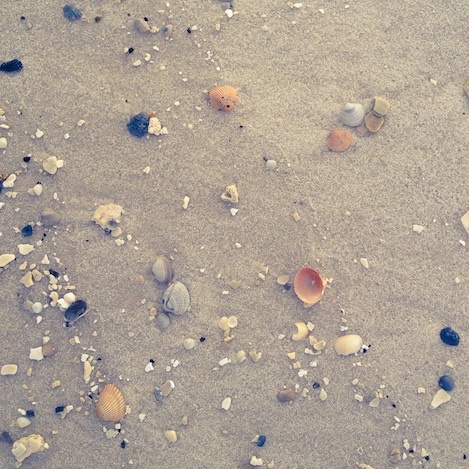 It’s not my intention to recreate the shells and sand in a representational way, but rather to take the colors and work them into one of my preferred designs. The next five steps are all part of dressing the loom. Once the design decisions and calculations have been made, it’s time to make the warp. 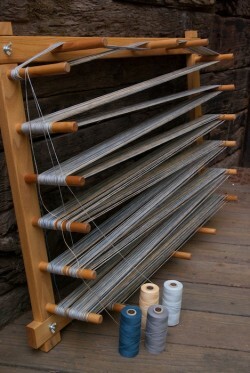 I wind out all the cotton threads, in order, on a warping board where the pegs are a yard apart. I make a warp as long as possible – almost twelve yards which enables me to weave a sample and 10 – 11 towels. When I take the warp off the board, I create a chain to prevent the long threads from becoming a tangled mess. With a special flat, brass hook, I pull two threads at a time through the slots in the reed. 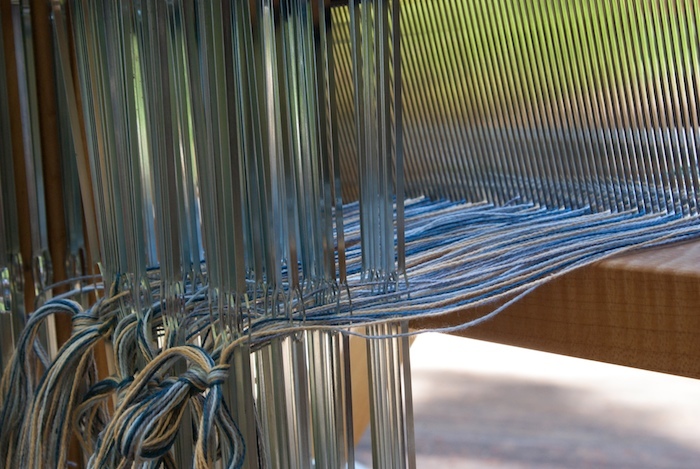 This comb-like reed determines how close together the warp threads are, as well as the width of the cloth, and keeps the threads straight as I weave. I sit down at the back of the loom, sometimes put on some music, and settle into the careful threading of each thread through a heddle. 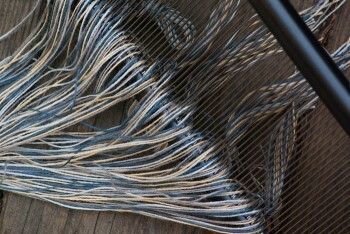 These strips of metal with the eye in the middle are each attached to one of eight frames or shafts. The sequence of these heddles affects the pattern of the woven cloth. Although it’s possible to correct mistake later, I find that it pays off to not hurry this process! 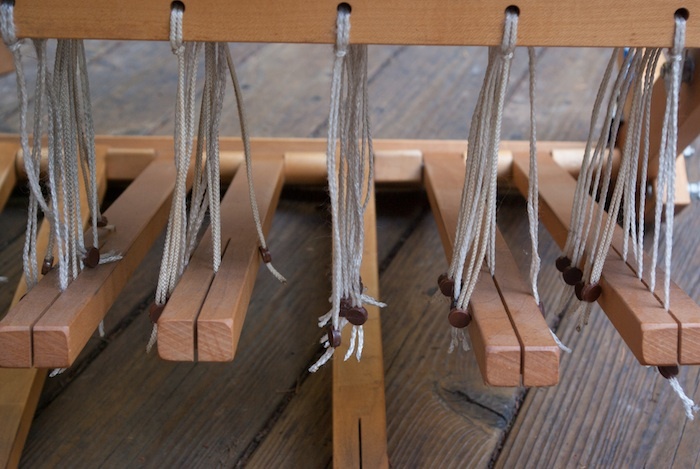 After the heddles have been threaded, I tie the ends to the back beam and wind the long warp onto the warp beam, stopping frequently to straighten threads and pull on them so that they wind on as evenly as possible. 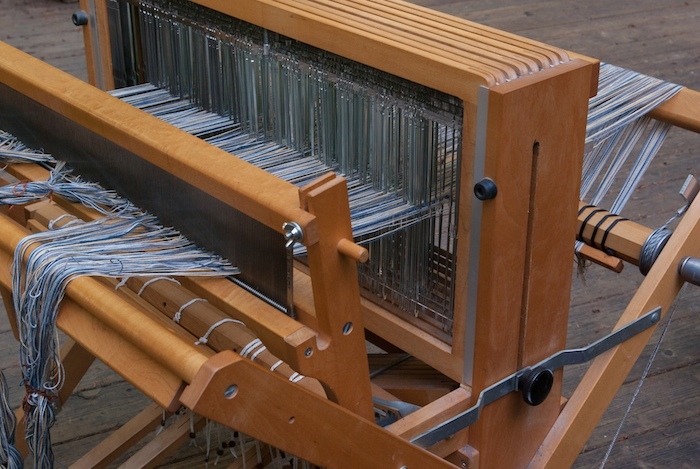 I crawl under the loom and attach the shafts to the treadles which function like levers. Stepping on a treadle raises the attached shafts with their heddles and threads. This creates the space through which I throw the shuttle. One of the things that fascinates me about weaving is that I can change the order in which I step on these treadles and thereby change the pattern in the cloth. 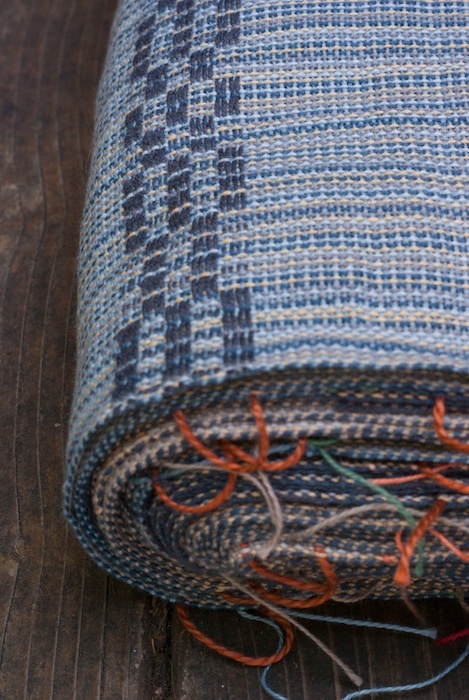 It’s finally time to weave a sample with different weft colors. Until now, it’s been lots of individual threads. 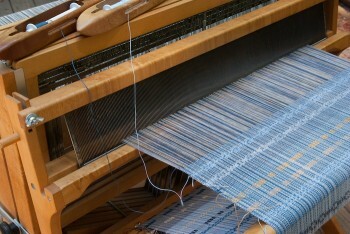 As the weft interlaces with the warp, the pattern emerges and I get a sense of the cloth. I look for and correct any mistakes I may have made in the previous steps. Over the years I’ve grown more experimental, trying out more weft colors and this has taught me a lot about colors and how they interact. I’ve learned to reserve judgment until the sample has been washed and dried because the cloth changes slightly. I’m often surprised by what I like and don’t like. After the sample has been washed and dried, I decide which weft colors I like best and start weaving. I weave one towel, then weave a quarter inch with a contrasting color to mark the end of that towel and the beginning of the next. 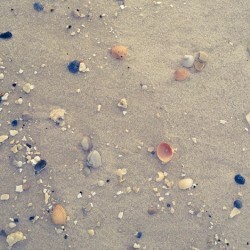 The original source of inspiration – the shells and sand – fades into the background and my love of pattern and variation kicks in as I figure out ways to make each of the 10 – 11 towels different. For example, I wove two towels with a khaki weft, one with charcoal accents stripes, the other with melon stripes. For me, this is part of the whimsy in Whimsy & Tea. I relax into the rhythm of weaving and the joy of making cloth. It still amazes me that I can take hundreds of individual threads and make cloth, something so basic in our lives. 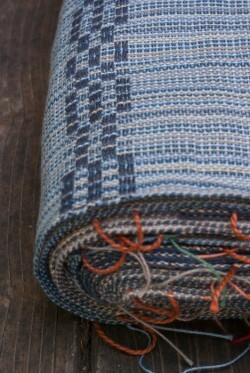 I love unrolling the yards of woven cloth from the loom. After washing and drying it, I cut the towels apart and iron them. Finally, I put my feet up with a cup of tea and hem each towel by hand. I enjoy holding the finished cloth and hemming them by hand helps me see the towels in a new way and appreciate what I’ve woven. 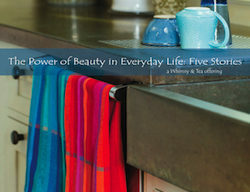 Now it’s time for the towels to move out into the world and bring beauty into people’s everyday lives. My invitation to you: Ask me a question about this process! What else would you like to know? What isn’t clear? 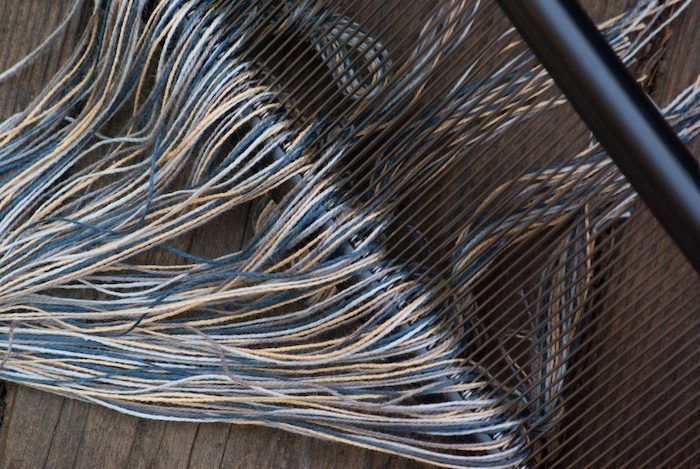 Are you getting a clear sense of the process of weaving? I’d love to hear. I really enjoyed this article Marilyn. It’s a beautiful pairing of words and photographs. And a wonderful description of your process. I feel like you’re taking me on a little journey. The hardest thing about your newsletter is seeing your beautiful towels and wanting to buy all of them. I love the subtly and nuance in the patterns you create with color. I posted a link on FB so others in my network can enjoy your artistry. I’m so glad you enjoyed it, Judy, and that it felt like you were going on a journey. I had a lot of fun taking the photos and putting it together. Thanks for sharing the link with your FB network. I really appreciate that. I really enjoyed reading the process from start to finish — very clear descriptions. 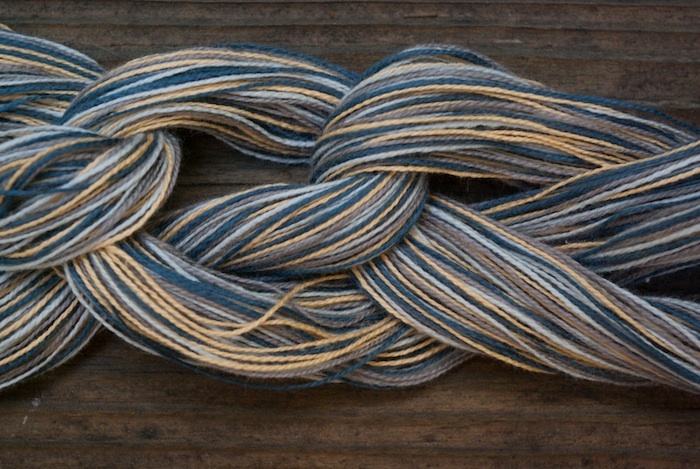 I love the cotton threads and the colors you use. Do you weave with other types of thread or wool? You are most welcome, Barb. I’m glad to know it makes sense. Thanks for asking a question! I have woven other fibers besides cotton — tencel, silk, and a wool/silk blend — but those have all been scarves. 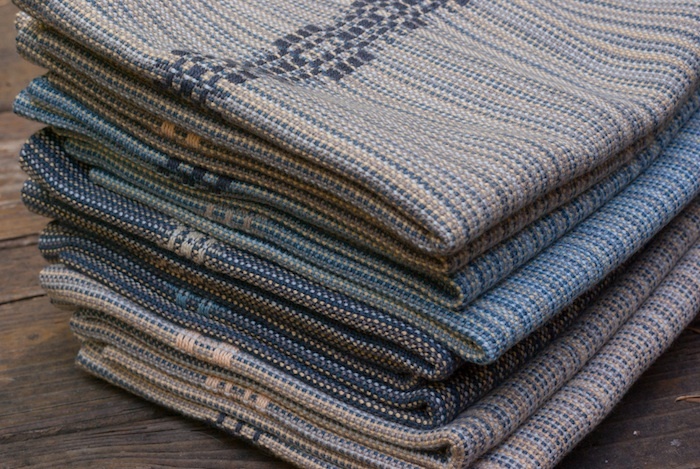 In my opinion cotton, and possibly linen, makes the most sense for the things I particularly love to weave, namely towels, napkins and table runners. When warping , how do you keep the various coloured threads in order. Do you warp 5 colours at a time?